Welcome to Outdoor Wednesday over at A Southern Daydreamer! chortling noises and alarm calls as they peck their way around the garden. but they are so amusing to watch. This California Scrub Jay is one of about 8 that live in the trees at the back of our property. get more than their fair share of the free buffet. Obviously you are not having roast quail for dinner? No, of course not. We have Stellar Jays here and if you leave your door open they will come right in the house demanding their food. Not shy at all. These such cute critters... great capture. 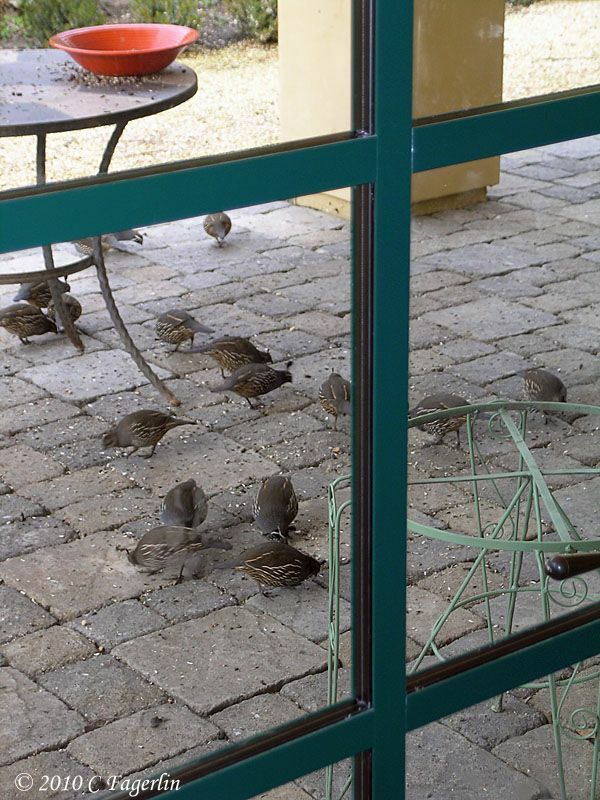 They may be messy, but you are so lucky to have quail at your door like that. Great photos, thanks for sharing! A very nice quail shot. They are cute to watch, but as you said, messy too. How beautiful!!... (I get excited over sparrows)...Those are wonderful photos, too. 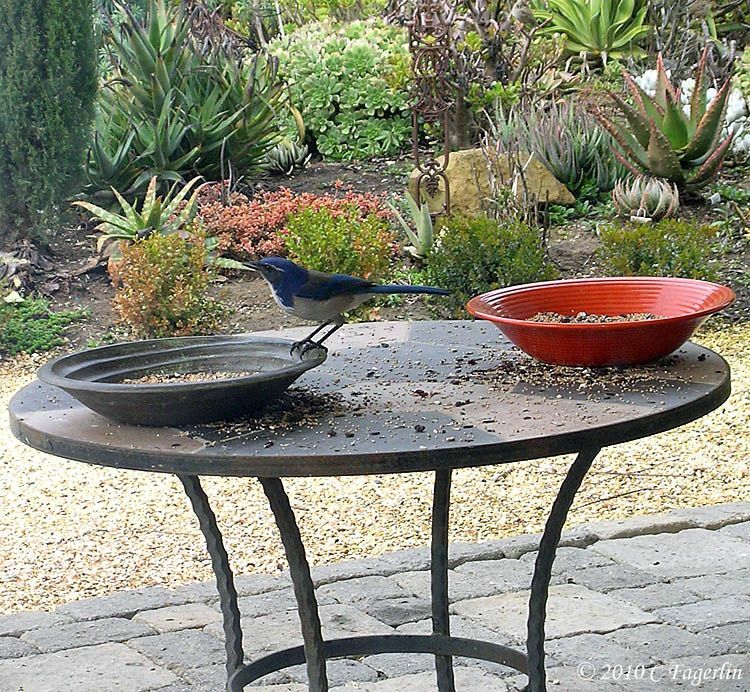 We have blue jays-I never saw a scrub jay. We have juncos now and we call them snowbirds-so cute. Quail that close to your house for a photo shoot is amazine. Nice job! I love birds, so this post absolutely delights me! 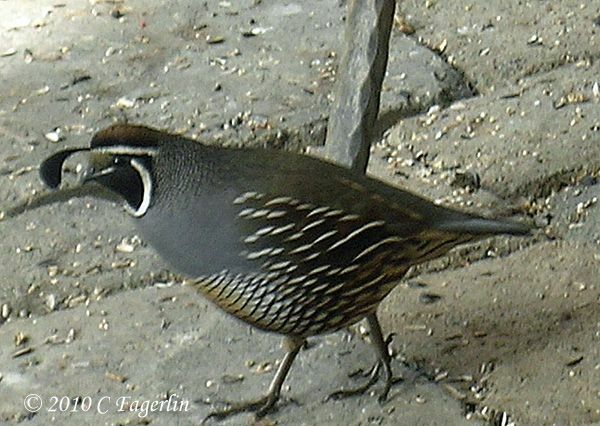 I have never been that close to quail -- they are beautiful! It's so nice to meet your feathered friends. Does Homer watch them? I know two kitties who would spend all day watching the birds if they could. What a lovely garden you have. Love the quail. I have not seen wild quail since I lived in Connecticut. I agree with you completely - birds are messy but fun to watch. Thank you for sharing them with us today. Great shots! The birds certainly look like they're enjoying themselves. All of our fowl friends are glad you enjoyed seeing them!! Cold and gloomy again today, so they are here in droves. The quail just paid their second visit of the day, but were very wary since the hawk has been around again. My hope is that in the Spring I will be able to capture images of our Red Headed Woodpeckars and if I'm very lucky our Yellow Billed Magpies. The first year we were here there was one pair and by last year, just two years later, there were 4 pair nesting in our oak trees. The Yellow Billed Magpies were hit hard by West Nile Virus a few years ago, but seem to be making a comeback here in our little corner of paradise. So Homer and the birds ..... he pretends to be interested, but really could care less about them when it comes right down to it. He was an indoor cat until a couple of years ago, so perhaps the hunting instinct was not properly instilled when he was young. "OH How I Wish we had QUAIL here in Connecticut"... I think they are one of my "favorite little birds with SO much character"... We do have BOBWHITE... and I Love them Dearly, BUT "I Wish we had QUAIL here in Connecticut"... I figure if I keep saying it over and over MAYBE like Dorothy in OZ it will come true!!! 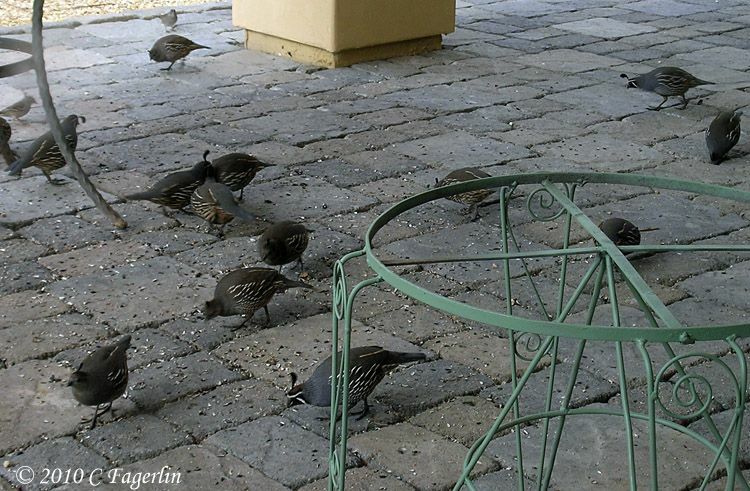 The quail are here all the time and are now bringing their large families along for the free daily buffet. Most of the tiny babies can't make it over the wall, but the main gate was open for a delivery the other day and one Mama brought in her 14 two inch tall new chicks! They are just too cute to believe.